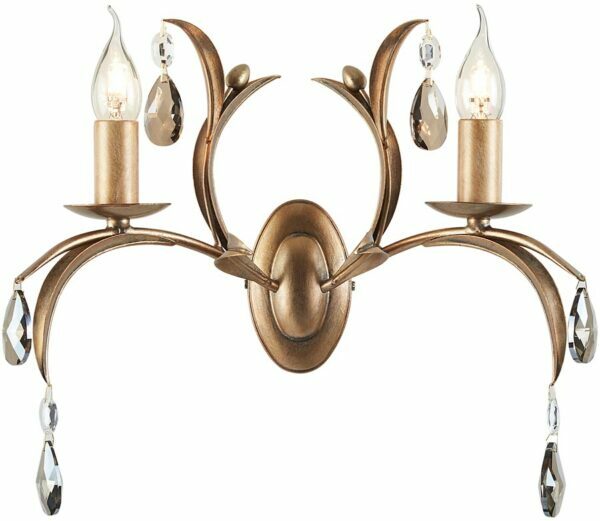 This Elstead Lily Italian style 2 lamp wall light in metallic bronze finish with smoked cut glass drops is handmade in England. An exclusive design hand finished to the highest quality. Lovely double wall light finished in a hand applied metallic bronze, with an oval wall mount and lily leaves and buds sprouting gracefully from the centre. Decorated with matching candle drips, candle tubes and cut smoked glass buds and drops to add the finishing touch. This stylish light is supplied by Elstead Lighting, a British company that specialise in the manufacture and distribution of quality decorative lighting such as the Lily Italian style 2 lamp wall light in metallic bronze finish with smoked cut glass drops you see here.